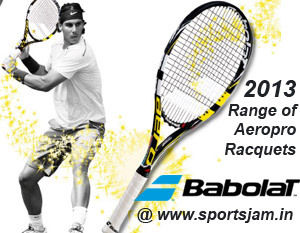 Babolat is a top international racquet sports brand, supplying Tennis equipment to generations of champions. Also the inventor of racquet strings, Babolat has built a reputation of quality, offering tennis products at the forefront of technology. Some of the top international players using Babolat tennis racquets and equipment are Rafael Nadal, Kim Clijsters, Andy Roddick, Leander Paes, Fernando González, Jo-Wilfried Tsonga and many more. Babolat works closely with the players and analyse the game to innovate, keeping performance as top priority; Babolat has perfected Nadal's Aeropro Drive Racquet with its unprecedented aero-dynamic cross-section. Choose Tsonga's Babolat Pure Strike 100 for a Power packed and high precision racquet or the latest Babolat Pure Control racquet. Buy Babolat Combo Packs @ 50% discount online on Babolat Racquets + Babolat Pro Extreme reels. We stock the full range of Intermediate and Junior racquets by Babolat at attractive discounts online upto 40% and free shipping in India. Top quality Babolat Tennis Strings for optimum spin and comfort are available in bulk quantity like Babolat RPM Blast Reel of 200mtr @ upto 50% discount. Improve your performance with Babolat Tennis Shoes designed with maximum shock absorption characteristics for smooth footwork @35% off like Babolat Propulse 4 All Court Shoes. We also stock the entire range of Babolat tennis gear like Babolat Gold and Babolat French Open balls, Babolat kit bags, grips and accessories for online purchase and quick delivery in India. Choose online from the latest range of Babolat Racquets, Shoes, Bags and all other Babolat equipment in India at best deals. Get delivery real quick, and right at your doorstep. Cash on Delivery is available in select locations in India.